Toots Thielemans, Jazz Harmonica Baron, Dies At 94 The Belgian-American musician, also known for his guitar playing and whistling, performed with the stars of postwar jazz and was widely heard on film scores and commercial jingles. 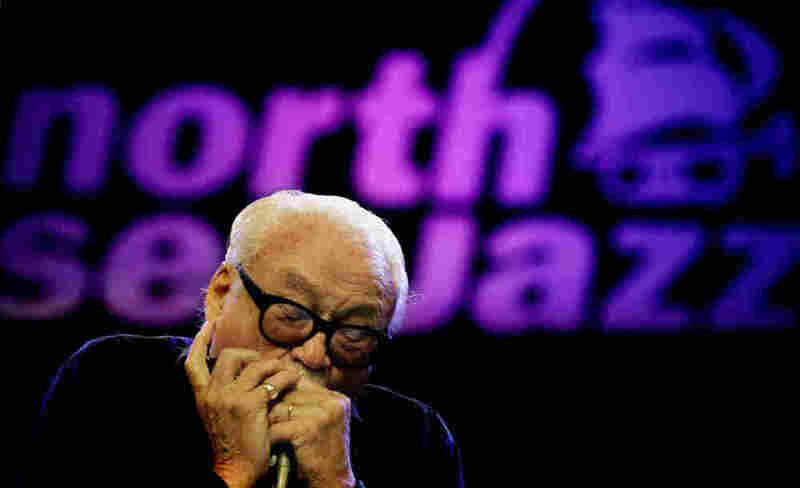 Toots Thielemans performs at the North Sea Jazz Festival in the Netherlands in 2005. Jean-Baptiste "Toots" Thielemans, the Belgian-American musician who cut a singular path as a jazz harmonica player, died in his sleep Monday in his hometown of Brussels. He was 94. He began his professional career as a guitar player (and added the ability to whistle a line above it), but inspired by the mid-20th-century innovations of Charlie Parker and Dizzy Gillespie, he returned to the chromatic harmonica and developed a bebop-influenced technique on it. He performed and recorded widely with his bebop heroes and many other stars of postwar jazz, and his tune "Bluesette" quickly became a jazz standard. His work also graces many film and television scores. Thielemans' first instrument was actually the accordion; he was a child entertainer in the Brussels sidewalk cafe run by his parents. As a teenager, he took up harmonica and guitar, but he still didn't dream of music as a career. "Being a musician was not really a profession, so you needed to try to get a diploma," he told Marian McPartland for a 2005 episode of Piano Jazz. He pursued a degree in mathematics instead. "But Louis Armstrong changed all that." He had heard jazz, and it became his passion, playing along to radio broadcasts of swing bands and, later, bebop. However, the harmonica was and is still best-known as a blues or folk instrument — or a toy — and he faced an uphill battle for acceptance. "And the musicians say, 'Hey, you could be a good musician, you know,' " Thielemans said on a 1997 episode of NPR's Jazz Profiles. " 'But throw this away, get a real instrument.' So that's how I became a guitar player." In 1948, he visited the U.S. for the first time and sat in on a few jam sessions. He caught the ear of an agent for star clarinetist Benny Goodman, who invited Thielemans to join Goodman on a European tour. "It's like a painting with a lot of pastel colors," he said. "It's not red, it's not black — it's some of those tones in between. ... So between plus, between minus, between happy and not-so-happy." He demonstrated on the song "You Don't Know What Love Is." "A tear comes quickly to me, or a smile, you know. That's where my music is, I guess." As the 1960s dawned, he added another trick to his bag. Inspired by singing bassist Slam Stewart, he started whistling in unison with his guitar. It's showcased on the original recording of his tune "Bluesette," which soon became an international hit. The device caught the ears of fans — and more. Thielemans became a first-call studio musician for top arrangers like Quincy Jones. His harmonica graced the theme song for Sesame Street and the score for the movie Midnight Cowboy. And that's his whistling in the commercial jingle for Old Spice toiletries. Jazz remained his first love; even toward the end of his career, he would begin every morning with practice on the complex changes to John Coltrane's "Giant Steps." Harmonica player Howard Levy says Thielemans kept pushing himself to expand his musical vocabulary in an emotionally compelling way. "Toots was a transcendent musician," Levy says. "If he had picked up any other instrument he would have been just as great. ... He was really playing music through the harmonica rather than playing the harmonica." He suffered a stroke in his 60s, which limited his facility for playing the guitar, but he continued touring. He was named a National Endowment for the Arts Jazz Master in the U.S., and a baron by the king of Belgium. And he only retired from performing at the age of 92.